I have generated a steel plate resting on a concrete slab. The deformation of the plate is going through the slab. When I insert an elastic surface foundation for the steel plate, the concrete slab is not loaded. How can I build the contact between the plate and the slab, and how can I model a lifting in case of tension? If surfaces are not connected with each other (by surfaces or members), they may deform through each other. Then, collision or contact of elements that are not connected cannot be considered in the calculation. By inserting an elastic surface foundation, you only fix the steel plate toward the global space, and thus the plate is only supported by the foundation. It does not forward any internal forces to the concrete slab as they still do not have any connection. Therefore, it is necessary to connect both surfaces with each other, either by surfaces or members. In order to model a lifting under tension, you can create a contact solid connecting both surfaces with each other. Using the contact solid option, you can define many other properties in addition to 'Failure under compression or tension'. The settings include for example different friction factors of the surface. 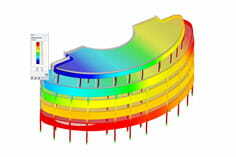 The picture shows an example for such a modeling. An end plate is coupled with the floor slab by means of a contact solid (failure under tension). The tension forces are transferred into the slab by anchors. It is possible to model this contact problem in RFEM. Create a solid between the concrete slab and the steel plate. The solid gets the "Contact" property. For the contact, you can define nonlinear properties set perpendicular or parallel to the plate plane.